Just realised that I put this post on last year's announcement - apologies for the mistake. Bryan Creer and I (Spare Parts) will be running some concertina part-playing sessions at Whitby Folk Week 2019. When we know how many, Bryan will put the music on the band website (http://www.sparepartsband.co.uk/SPTunes.php) as dots and midis for people to try out. We'll produce a couple of sets to go in the workshop showcase concert at the end of the week, but there will be other arrangements as well. You'll be very welcome to have a bash at the arrangements whether you're coming to our Whitby sessions or not. Some arrangements we produced for the Tenterden and Lewes Folk Festivals last year are still available on the website - feel free to give those a kicking, too. They will work on any melody instrument. Delighted to say that Bryan Creer and I (Spare Parts) will be running some concertina part-playing sessions. When we know how many, Bryan will put the music on the band website (http://www.sparepartsband.co.uk/SPTunes.php) as dots and midis for people to try out. We'll produce a couple of sets to go in the workshop showcase concert at the end of the week, but there will be other arrangements as well. You'll be very welcome to have a bash at the arrangements whether you're coming to our Whitby sessions or not. Some arrangements we produced for the Tenterden and Lewes Folk Festivals last year are still available on the website - feel free to give those a kicking, too. They will work on any melody instrument. Confused now. Should I have put this straight on the calendar? I just tried to do that with a different event but it's not showing there (18th. November). Tenterden Folk Festival Sunday 8th. October, 16:00 17:30 Glebe Hall, Church Road, Tenterden, Kent TN30 6AT, UK Spare Parts Concertina Band (Bryan Creer and Valmai Goodyear) bring three 3-part arrangements of traditional tunes for people to play together. They will suit any meldody instrument, not just concertinas, and all are welcome. You can download the tunes now from the Spare Parts Band website at http://www.sparepartsband.co.uk/SPTunes.php in midi (each harmony line separate) pdf and Noteworthy Composer. Feel free to try them out even if you aren't coming to the workshop. The tunes are Strily Vale, Christmas Box and A Sussex Waltz. Bryan & Valmai help to run Lewes Saturday Folk Club in Sussex (www.lewessaturdayfolkclub.org) and also collaborated with Andy Warburton to publish the well-known Lewes Favourites tune books. The advance music for this is now ready to be sent out. We have a few evening tickets left for Leveret and preference is given to people who are booking for one of the workshops,. Sam Sweeney's is sold out and we only have three places left for Andy Cutting's. The advance music for this will be ready soon. We have some places for the workshop, and some tickets for Rob's evening performance with Leveret at Lewes Saturday Folk Club. Cor, thanks for the kind remarks. The arrangement is published in Matt Seattle's Book 'Scottish Airs for Pairs'. He has also produced 'Airs for Pairs' and 'More Airs for Pairs'. His arrangements are inventive, lively and beautiful. James Oswald's 'Calendonian Pocket Companion' (shouldn't that be Sporran Companion?) isn't in print but there are several downloadable versions on the internet: try http://imslp.org/wiki/The_Caledonian_Pocket_Companion_%28Oswald,_James%29 and https://archive.org/details/caledonianpocket01rugg. Matt is a brilliant Border piper, guitarist and fiddler. He's researched and published several collections of Border music as well as composing his own. His website is http://www.dragonflymusic.co.uk/. Matt is doing an all-day workshop on arranging traditional tunes for any instrument at Lewes Saturday Folk Club on Saturday 2nd. July and performing at the folk club in the evening. 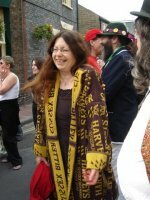 Full details, timetable and a booking form are in this link: http://www.lewessaturdayfolkclub.org/LAFC/WS223desc.html. Sorry about that, I think I've corrected it now.